4 Your UTK e-mail account is compromised and has been restricted.You cannot send/receive messages until you re-activate your account. If your account isn’t responding to us it will be permantently deleted. 5 This is the LAST NOTICE. 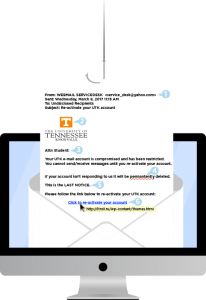 1 Sender’s email address: Official UTK communications will always be sent from a utk.edu address. However, be cautious; just because it does come from a utk.edu address does not guarantee that it is legit either. 2 Don’t be duped by aesthetics: Phishing emails often contain convincing logos, links to actual company websites, legitimate phone numbers, and e-mail signatures of actual employees. 3 Impersonal or awkward greeting: Most phishing emails DO NOT refer to the recipient by name. 4 Check for errors: While scam emails are becoming more sophisticated, many scam emails contain misspellings and grammatical errors. Read your emails carefully and report anything that seems suspicious. 5 Urgency/Fear: Scammers use threats and urgency to scare you into acting immediately. If you are concerned, always contact the organization directly whether by phone or online. Never reply to a suspicious email. 6 Bad Links: Always hover your mouse over a link to see the true destination. If you see a long, unfamiliar link, it’s likely a phish. When in doubt, contact the OIT HelpDesk for assistance at 865-974-9900 or visit help.utk.edu.